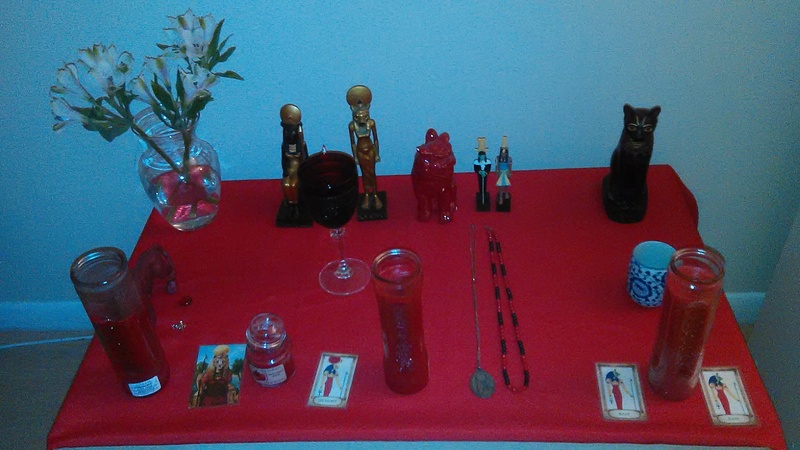 Here is my Sekhmet-Mut shrine in my home. You’ll notice my small Bast-Mut shrine is right next to Her in the image. Other items you may need: a pitcher to pour the water libations into the bowl and matches or a lighter to light the candles or incense. You can use electric candles and oil diffusers if you can’t use an open flame. Also if you cannot use incense, then some alternatives might be a small cup of Florida Water or fresh flowers. Keep Her shrine simple and neat. Sekhmet’s colors are red, white and gold.